Conquest of Grenada. Boabdil el Chico's Farewell. Home » Conquest of Grenada. Boabdil el Chico’s Farewell. Conquest of Grenada. Boabdil el Chico’s Farewell. Conquest of Grenada. 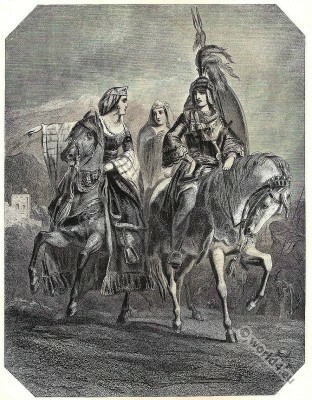 Boabdil el Chico’s Farewell by Washington Irving. E. Corbould; Artist. H. Lemon, Engraver. Muhammad XII. 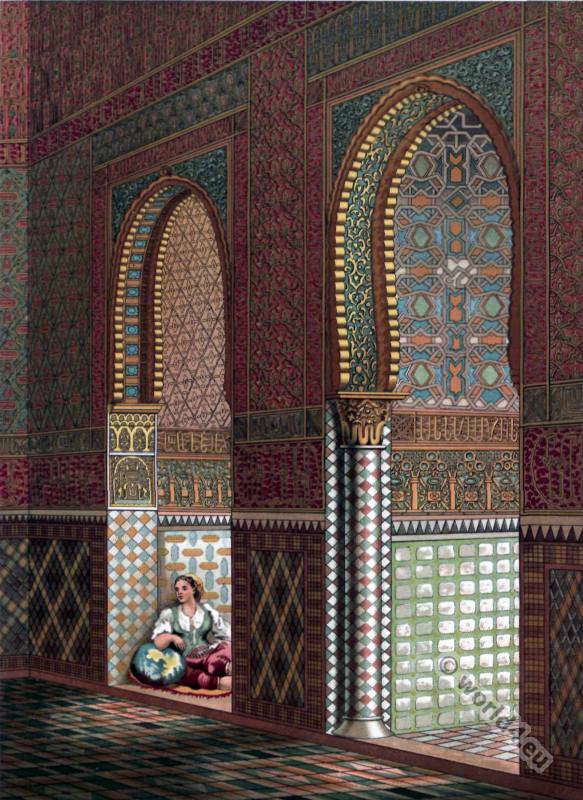 Abu Abdallah born 1459 in Granada; died in 1518, 1533 or 1536 in Fes. In the Christian Spaniards of his time as Boabdil known, also called el chico, “the boy” or “the unfortunate”, was 1482-1483 and 1485-1492 Emir of Granada. After 1487 Málaga was conquered by the Spaniards, began in 1491, the siege of Granada by the Spanish troops. On January 2, 1492 Muhammad XII surrendered and handed over Granada to the Catholic Monarchs Isabella of Castile and Ferdinand of Aragon. With the conquest of Granada by the Christians fell by about seven hundred years, the last Muslim bastion on the Iberian Peninsula. At the pass south of Granada is a place from which a last view of the city is possible. This place is called El suspiro del moro (the sigh of the Moor) because Boabdil is said to have cast a last look at Granada from him. His combative mother had scolded him that he should not mourn as a woman, what he does not like a man had been able to defend. Side of the Blessing hall in the Alhambra at Granada. 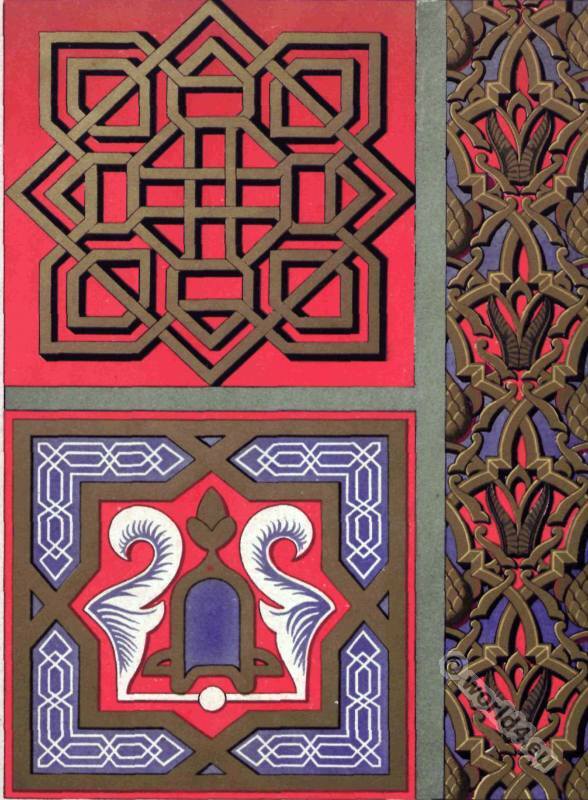 Moorish art. 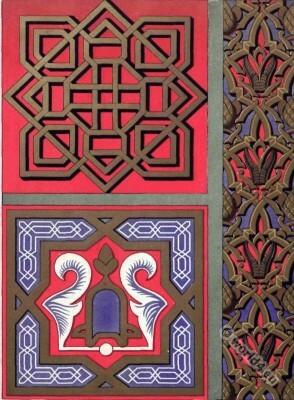 Motifs of decoration at the Alhambra in Granada. Washington Irving (1783-1859) was an American writer. 1829 published Irving A Chronicle of the Conquest of Granada, and after visiting the Red Fort of Granada 1829 the short story collection Tales of the Alhambra. In these works he condemned the barbarity of the Christian conquerors against the high culture of the Moors. Irving was also one of the first writers who condemned the persecution of the Indians in focus by the whites. In 1842 he was appointed as United States Ambassador in Spain. He was during his lifetime, next to James Fenimore Cooper, the internationally most widely read American author. He was the first who was able to live on his books. Irving is particularly important for the development of the short story that has gained great prestige, especially in American literature. The designation as a short story took place subsequently; Irving himself described his short prose pieces as sketches and short tales. Generally considered three pieces from the Sketchbook, including Rip Van Winkle, The Legend of Sleepy Hollow and today hardly read The Spectre Bridegroom piece, as the first short stories of American literature. Furthermore characterized Irving two today common nicknames for New York and its inhabitants: Gotham City for the first time in 1807 used in Salmagundi, went to refer to New York in the 19th century in everyday language and is today mainly by the Batman comics known. Less popular, however, is the name of the New York residents as Knickerbocker, inspired by the name of Irving’s alter ego in the history of New York and Rip Van Winkle, but at least in the name of the traditional basketball team New York Knicks alive. Washington Irving and his friends at Sunnyside by Christian Schussele (1824–1879). 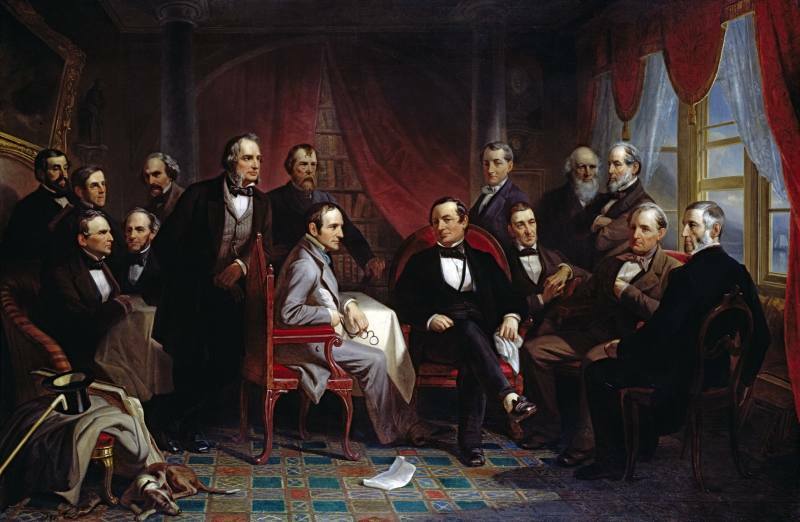 This painting by Christian Schussele from 1864 shows a meeting of contemporary literary greats of the United States in Washington Irving’s library. The representation of Irving as host and focus of this never took place summit of American literature, emphasizes the high value he had in the 19th century. From left to right are shown: Henry Theodore Tuckerman, Oliver Wendell Holmes, Sr., William Gilmore Simms, Fitz-Greene Halleck, Nathaniel Hawthorne, Henry Wadsworth Longfellow, Nathaniel Parker Willis, William H. Prescott, Washington Irving, James Kirke Paulding, Ralph Waldo Emerson, William Cullen Bryant, John Pendleton Kennedy, James Fenimore Cooper, George Bancroft. Sunnyside is the former estate of the American writer Washington Irving in the city of Tarrytown, New York. Since 1962 it is registered as a monument of national importance (National Historic Landmark). In 1966, enrollment in the National Register of Historic Places. Associated to: Boabdil, last Moorish king helmet, 15th century. This entry was posted in 16th Century, Genre, Spain and tagged Character sketches, Moorish costumes on 4/11/15 by world4.